Click here to see a separate post about Sister Schubert and her cookbook. 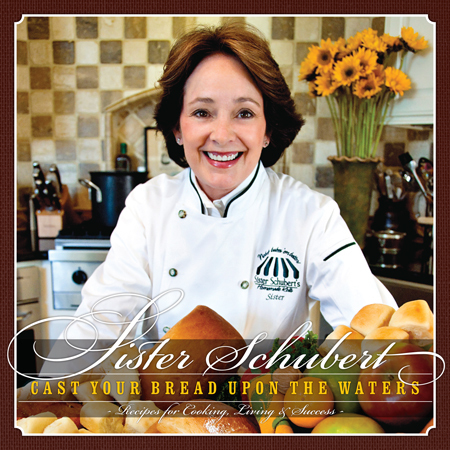 Sister Schubert, aka Patricia Schubert Barnes, wrote Cast Your Bread Upon the Waters—Recipes for Success, Cooking & Living to share her popular recipes and to tell her family’s story. 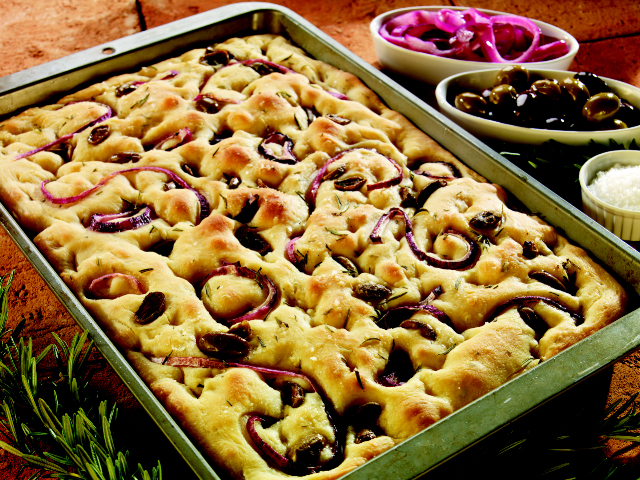 Here is her recipe for making focaccia, a type of bread that dates back to ancient Roman times. Ideas for toppings: Coarse sea salt, fresh rosemary, freshly cracked black pepper, sun-dried tomatoes, thinly sliced red or yellow onion, sliced rip olives, grated Parmesan or Romano cheese. Combine water, sugar and yeast in a small bowl; set aside for 10 minutes. Stir in 2 tablespoons olive oil. Combine 2 cups flour and 1 teaspoon sea salt in large bowl of mixer fitted with dough hook. Add yeast mixture and mix on medium-low speed for 5 minutes. Add remaining flour and continue mixing to form a very soft dough. Dough should hold together; if dough is too sticky, add a few tablespoons of flour and mix until consistency is correct. Place dough in a well-oiled bowl; turn to coat top. Cover with a damp tea towel and allow to rise in a warm place (85°F), free from drafts, for 1½ hours or until doubled in bulk. Pour 2 tablespoons olive oil into a 10 x 15-inch rimmed baking pan. 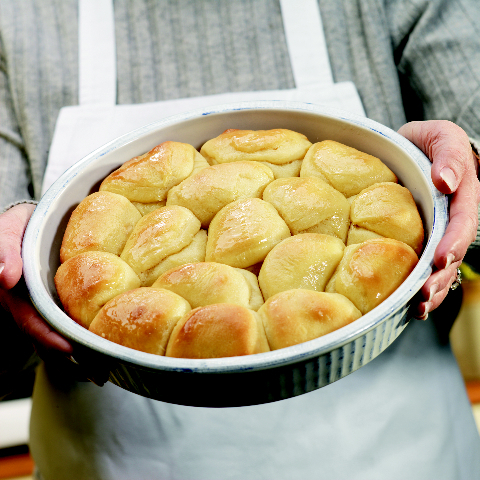 Transfer dough to the pan and gently stretch to cover the bottom of the pan. Dough may need to rest for a moment or two during this process. Try not to tear the dough. Cover dough loosely with a damp tea towel and allow to rise in a warm place for 15 to 20 minutes. Remove towel and drizzle 2 tablespoons of olive oil over surface of dough. Using your fingertips, indent the surface of the focaccia and add your choice of toppings, gently pressing them into the indentations. Bake for 20 to 25 minutes, or until focaccia is golden brown. Cool on wire rack. Brush with additional olive oil if desired. From Cast Your Bread Upon the Waters by Sister Schubert (© 2009 by CECA Enterprises LLC, $40). Excerpted with permission. Sister Schubert provided a copy for review. Sister Schubert, aka Patricia Schubert Barnes, wrote Cast Your Bread Upon the Waters—Recipes for Success, Cooking & Living to share her popular recipes and to tell her family’s story. 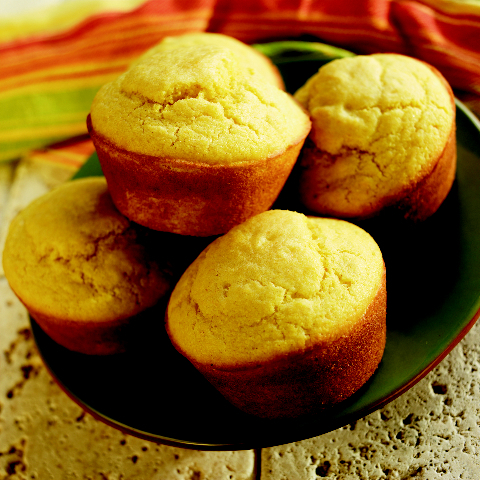 Here is her traditional Country Corn Muffin recipe, which will put your cast-iron muffin pan (or a regular pan if you don’t have cast-iron) to good use. Sister even includes helpful tidbits from her grandmother, known affectionately as Gommey. Combine first 5 ingredients in a large bowl. Combine eggs, milk, and oil; add to cornmeal mixture, stirring until dry ingredients are moistened. If using a cast-iron muffin pan, place well-greased pan into the oven for 5 minutes or until grease sizzles. Spoon batter into hot pans, filling muffin cups two-thirds full. * For regular muffin pans, spoon batter into greased pans, filling two-thirds full. Bake for 12 to 15 minutes or until muffins are golden brown. Remove from pans immediately. 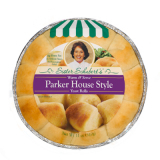 For more about Sister Schubert’s Homemade Rolls or to order a copy of the book, contact Sister Schubert’s Homemade Rolls, 100 Crenshaw Parkway, P.O. Drawer 112, Luverne, AL 36049; www.sisterschuberts.com; 334-335-2232.